Goodfellow Air Force Base (AFB) is a part of the Air Education & Training Command (AETC). They are a non-flying base and their main mission is to train air force members in cryptology and intelligence. The base is also the units from the Army, Navy, and Marine Corps located here as well as a Texas Air National Guard unit Training Squadron at Goodfellow. Home to the 17th Training Wing, Goodfellow Air Force Base is a United States Air Force training installation subordinate to Air Education & Training Command (AETC). Goodfellow’s chief mission is to develop and deliver training in the cryptologic and general intelligence career fields for Air Force, Army, Navy and Marine Corps personnel plus students from certain Allied countries and national agencies. Specifically, the intelligence curriculum includes courses in cryptologic linguistics and analysis, intelligence applications and operations, imagery, targeting, and intelligence-related communications and electronics maintenance. In addition, the base provides fire protection-training for multiservice personnel and special instruments training in support of the US Atomic Energy Detection System. Located on 1,002 acres near the west Texas community of San Angelo, Goodfellow’s assets include more than 200 buildings on base, many of them accredited to hold and process sensitive compartmented information (SCI), plus an additional 200 units of leased housing near Lake Nasworthy. All told, an infrastructure in excess of $600 million and an annual operating budget of $66 million supports almost 15,000 active duty personnel, dependents, retirees and civilians while nearly 400 acres on the eastern side of the base remain available to attract and sustain new missions. The base hosts a number of tenant organizations, including the 344th Military Intelligence Battalion (Army); the Center for Cryptology (Navy), and a Marine Corps detachment. Additionally, the base hosts a Department of Transportation tire-testing facility. Goodfellow’s history traces to the days before Pearl Harbor, but its name registered the valor and sacrifice of an earlier conflict. 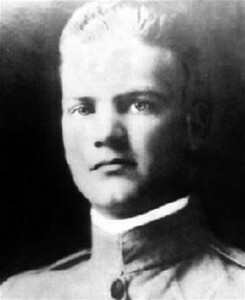 On 14 September 1918, 1Lt John J. Goodfellow, Jr., of San Angelo, Texas, boarded his Salmson 2A2 observation plane at Gondreville Airfield in France to conduct visual reconnaissance behind enemy lines. The mission was part of a larger undertaking just underway, a major American offensive intended to reduce the German salient near St. Mihiel. Unfortunately, adverse weather permitted observation only from reduced altitude, a condition which exposed the lumbering Salmson to enemy pursuit. Three days later, the offensive a success, the young pilot’s remains were recovered from his ruined craft and interred at the US military cemetery near Nancy, France. The peace that arrived two months later endured a mere two decades more. Constrained by neutrality legislation, but witness to the train of aggression across Europe, Africa and Asia, President Franklin Delano Roosevelt began a program of preparedness which included the construction of facilities dedicated to advanced air training. Several such bases were envisioned for Texas and one, specifically, for the Fort Worth-Midland-San Angelo triangle. Civic leaders from San Angelo immediately commended their community to the War Department. A generous offer of sewage and electrical service, a railroad spur, and a 50-year lease on 640 acres at one dollar per year easily decided the issue. Construction of the new San Angelo Air Corps Basic Flying School began at once. Officially established on 17 August 1940, the base. was ready for occupancy by 21 January 1941 and the first classes of students soon arrived. On 11 June 1941, in dedication to a young hero and in tribute to the community that shaped him, the base was officially renamed Goodfellow Field. The next four years witnessed the graduation of more than 10,000 trained pilots and the decoration of scores of these for outstanding heroism in action against Germany, Italy, and Japan. Still, the Axis collapse did not dissolve the Goodfellow mission. That was the lesson learned from that earlier day, from the peace that would not last. Goodfellow continued to train pilots into the post war, first on the AT-6 “Texan” and then, beginning in 1954, on the twin-engine B-25 “Mitchell.” On 3 September 1958, with nearly 20,000 aviators to its credit, Goodfellow graduated its last class of pilots. It was a new mission now, and a look into the future. With the transfer of the base from Air Training Command to the USAF Security Service, Goodfellow’s mission became the training of Air Force personnel in the advanced cryptologic skills that the Security Service required at installations worldwide. Eight years later, in 1966, the mission expanded further to include joint-service training in these same skills for Army, Navy, and Marine Corps personnel. After 38 years of pilot and then intelligence training, Goodfellow’s mission had apparently come to a close with the announcement in 1978 that the base would revert to Air Training Command and was a candidate for closure. Since Goodfellow was a single-mission facility, its mission could perhaps be executed more economically elsewhere. By then, senior intelligence personnel had already begun seriously to contemplate the consolidation of all Air Force-managed intelligence training at one location. The site selected for intelligence training consolidation was Goodfellow, and the base was designated a technical training center on 1 March 1985. During the next three years, intelligence training consolidation brought to Goodfellow advanced imagery training from Offutt AFB, Nebraska; electronic intelligence operations training from Keesler AFB, Mississippi; and targeting, intelligence applications, and general intelligence training from Lowry AFB, Colorado. The successful completion of intelligence training consolidation on 30 June 1988 further facilitated the development of intelligence training integration, a multidisciplinary approach to the training of intelligence professionals. On 1 July 1993, the 17th Training Wing was activated on Goodfellow AFB. With the change in name came a marked diversification and increase in Goodfellow’s mission. Rounds one and two of the base realignment and closure process transferred special instruments training from Lowry AFB and fire protection training from Chanute AFB to Goodfellow. To support the increased training load, Goodfellow underwent extensive modernization and growth. With new training facilities, dormitories, dining halls, a commissary, a youth center and a physical fitness center, Goodfellow entered its second half-century of operation as one of the most modern installations in the Air Force. Train world-class Firefighting and Intelligence, Surveillance and Reconnaissance warriors. Be the standard for training excellence by enhancing training across air, space and cyberspace domains and providing the best facilities and services for our work force and families.